Goat simulation is finally leaving the planet to explore the endless possibilities of space (though we only had time to explore some of them). You no longer have to fantasize about colonizing space as a simulated goat as your dreams have finally come true! 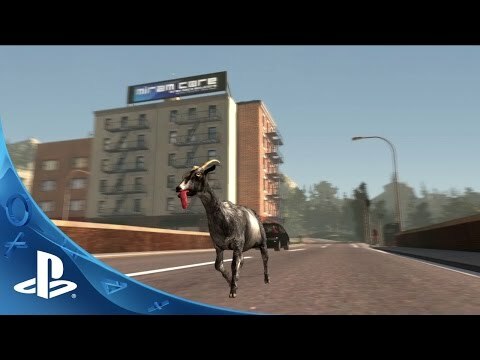 Introducing Goat Simulator: PAYDAY, the latest in goat simulation technology. Being a goat has never been this realistic! Buy things using your easy-earned cash. Mostly masks. Okay only masks. Long gone are the days of fantasizing about being a simulated goat in a fake MMO. Yes, my friend- your dreams have finally come true! With Goat MMO Simulator, you’ll almost believe you’re goating it up with other lovable nerds across the world. Complete epic quests for villagers, shake your hooves to snazzy lute tunes, and hang out with the most beautiful mermaids in gaming history (assuming you like that sort of thing). You’ll even experience faction warfare between goats and sheep so intense you’ll never look at those walking-sweater-factories the same way again (don’t call them that to their face). Dozens of quests, and play five different classes: Warrior, Rouge, Magician, Hunter and Microwave Level cap of 101. That’s right, not 100 but 101. Yeah, we went there. You can be a microwave. Did we mention the microwave? When is a goat not a goat? When he’s been bitten by a brain munching zombie, that’s when. Also when he’s a microwave, but that’s not in this DLC. Goatz guarantees* the finest physics-based-zombie-goat experience on the Xbox One. Eat tasty snacks (as a zombie), visit the mall (as a zombie) and catch up with old pals (other zombies) in three exquisitely detailed maps. Perfect for a quiet night in with your loved ones, best enjoyed over a glass of Cerebro Fluid Wine (brain juice). Zombies, because what would be the point otherwise? Be a simulated goat. Be another type of simulated goat. Or a dolphin in a wheelchair. Or a camel. Or a flamingo. The choice is yours in Goat Simulator: The Payday Bundle.